Confidence GTRPower 1100W – Right for You? Confidence GTR Power 1100W – Right for You? Confidence GTRPower 1100W is a treadmill ideal both for walkers and joggers. This treadmill is very good for fat burning right at the comfy of your home. You can get fit without the hassle of waking up early or going out just to walk or run. With treadmills you can run or walk any time of the day and even several times in a day. Weighing only sixty two pounds, you can easily move this machine around without any stress. It will not take much of space in your room since it is compact and small. You may also use this to walk your dog. Per many other reviews on some sites, the belt and motor of this treadmill operates quietly. What type of a treadmill user are you? Do you prefer to walk for long hours or run for shorter period? How you would like to do your workout is important in determining if a certain exercise machine is for you or not. To give you more direct information about Confidence GTRPower 1100W and save you time reading so many reviews, here are my views. If you want a treadmill that can be folded, then this is one of those types of treadmills you can consider. Folding type is very appropriate if your space at home is not enough or small. Since this treadmill is compact, it won’t eat up much space. A good amalgamation for its folding feature is its being light weight. You can easily move it around your home or room. Assembly is very easy as this model comes almost ready to use. With only few attaching and screwing, you are ready to exercise. So, if you are not much of a technical or mechanical person; this unit will suit you good. Confidence GTRPower 1100W is an electric treadmill equipped with adjustable manual incline for your more advance type of exercise. There are three settings for the incline that you can choose from. This model is ideal for home and for any gender. It is also foldable which makes it very convenient when storing and moving around. Actually, it is so light weight that any person can easily move it around. This treadmill model also comes with a multi-function LED display which can show the monitoring of your pulse and heart rate. It is powered by an 1100W/1.5 horsepower motor. The size of the walking/running area is 43.5 by 15.75 inches. If you fold it, the measurement would be 54 by 25.5 by 23 inches and the full measurement of the treadmill is 52 by 25.2 by 52 inches. However, when you receive the package, the measurement would be 56 by 27 by 11 inches with a weight of 68 pounds. This model of Confidence Treadmills is almost perfect for anybody’s use. But, we all know that there is nothing perfect because of the user’s personal perception. A few observed that the metal sensors at the handle fade or change color. The side part of the running belt is made of plastic which may break if you step on it. Also, few find it not suitable for long period of heavy running. There are few cases wherein the motor will stop automatically after walking for about an hour. This is tedious since you have to start all over again if you still want to walk more. This treadmill is compact and small making it very versatile in using up spaces in your home or office. Being able to be folded, it is very easy to move around. When you take out the treadmill from its box, it is almost ready to be used. You only need to do a little attaching and screwing and you are ready to walk or run on it. 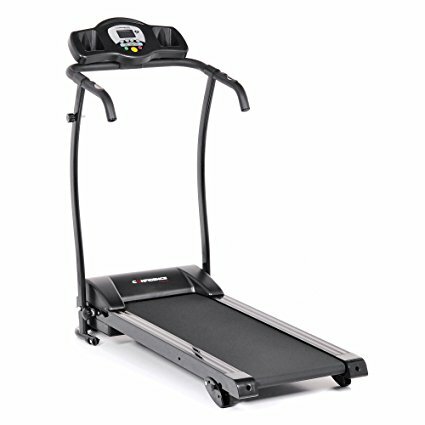 This treadmill is very light weight and easy to carry or move anywhere in your home. There are some owners and users who have been using this type of Confidence treadmill for over two years and declared that their unit is still working as they want it to be. If you intend to walk more than run for long period of time, this could be the treadmill for you. But, if you would like to do more extraneous running exercise, then you might consider other type or model of treadmill. However, with the price and some justifiable features, this could be a good buy. But then again, it would be best always that you look for other comparable treadmill and try it before making your ultimate purchase. This is something that you would be using daily so it should be something that suits you and one that will provide your needs. You may buy this product through Amazon.com at $269.99 and free shipping. If you prefer, you may buy it from other reliable sellers.